Gideon was a man who was willing to do exactly what God wanted him to do, regardless of his own judgment as to the plans or results. Humility, faith, and obedience were his great elements of character. This is the standard that The Gideons International is trying to establish in all its members, each man to be ready to do God’s will at any time, at any place, and in any way that the Holy Spirit leads. 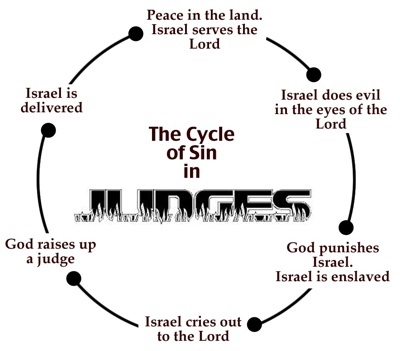 As we enter a new cycle of Judges…say it with me about what happened with Israel? A messenger comes, and through cooking, and food, and flame Gideon sees what he is meant to do. A direction is given to supplant the worship of Baal, by destroying and replacing with a worship of YHWH. It is interesting as this unfolds and you read the words in verse 11-27 how it can read like a science fiction story and makes one ponder the validity of a Paleo-Seti theology for this story. When the men of the town rose early in the morning, behold, the altar of Baal was broken down, and the Asherah beside it was cut down, and the second bull was offered on the altar that had been built. 29 And they said to one another, “Who has done this thing?” And after they had searched and inquired, they said, “Gideon the son of Joash has done this thing.” 30 Then the men of the town said to Joash, “Bring out your son, that he may die, for he has broken down the altar of Baal and cut down the Asherah beside it.” 31 But Joash said to all who stood against him, “Will you contend for Baal? Or will you save him? Whoever contends for him shall be put to death by morning. If he is a god, let him contend for himself, because his altar has been broken down.” 32 Therefore on that day Gideon[c] was called Jerubbaal, that is to say, “Let Baal contend against him,” because he broke down his altar. Interesting, it was an attacked designed to weaken moral of the enemy. You see, it was showing superiority of their God over another. Or perhaps their alien fleet backing them, ala Cold War geo-politics where one was backed by one super power or the next. Could this be the same thing? As the challenge is laid down, but does not appear to be met to bring Gideon forward, in fact a message is sent out why to further challenge the leadership. Then Gideon said to God, “If you will save Israel by my hand, as you have said, 37 behold, I am laying a fleece of wool on the threshing floor. If there is dew on the fleece alone, and it is dry on all the ground, then I shall know that you will save Israel by my hand, as you have said.”38 And it was so. When he rose early next morning and squeezed the fleece, he wrung enough dew from the fleece to fill a bowl with water.39 Then Gideon said to God, “Let not your anger burn against me; let me speak just once more. Please let me test just once more with the fleece. Please let it be dry on the fleece only, and on all the ground let there be dew.” 40 And God did so that night; and it was dry on the fleece only, and on all the ground there was dew. One would think that the messengers could speak directly to Gideon, or any of the people in their language, as we have seen in previous passages. Gideon takes a risk in “putting his God to the test” at a time when the almighty was testy. What it appears is an almost first contact like scenario, where one is finding ways to bridge communication and safety gaps between the cultures and species. Where the universal translator is faulty, but there is still a desire to continue discussion and planning as allies. As we enter into the next part of the story, it can be seen as miraculous, the few beating the many (though historically a well outmanned group what is usually seen is at most a holding force until re-enforcements), what is seen is a direct promise (Judges 7) to have their back. That is a promise of victory, how is this possible? In Paleo-Seti theology it is Gideon’s army being backed by alien technology. This can be seen in Star Trek episodes ala “A Private Little War” that saw the Klingons arming one side of a conflict, so that the Federation had to do the same (a balance of power). Is this a plausibility and possibility within the context of Judges? We had seen in written of in the Christian Testament, with the concept of the Elohim being the driving alien species in the emergence of homo sapiens, and the driving force being the contacts between alien and earth. It was a battle that dragged on, but with a small army, and superior technology Gideon was victorious. So much so that he was elevated in the hearts and minds of the Nation as not only a hero, but a leader. 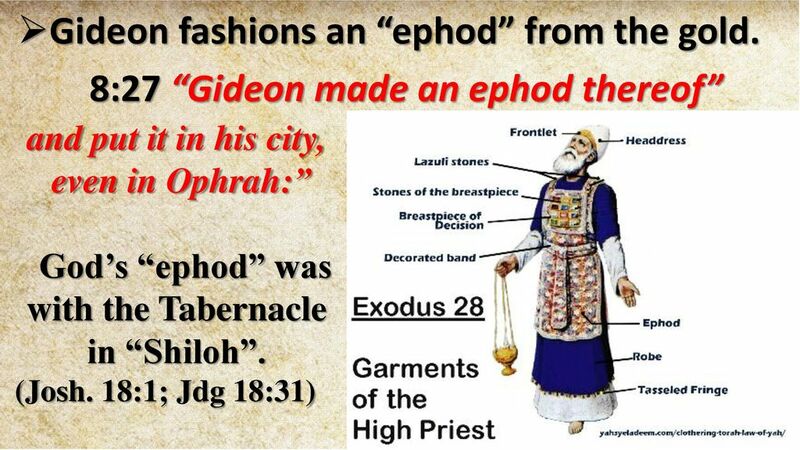 (Judges 8) One who could be seen as falling victim to his own hype, as he got the spoils of victory the golden earrings, which were then melted into an Ephod, a type of vestment worn by the highest priests, his was made of solid gold. As is noted in Paleo-Seti theology, the design of the vestments of the Temple times, were designed using the best of ancient world materials to provide safety from radiation in/around space vessels. The fact that Gideon crafted this type of garment can be seen as raising a level of protection, but also due to the value of the garment showing that Gideon has surrendered a bit into his own elevated hype. For the vestment is crafted to place him above the high priest, into an almost King like space for the people. It is one to ponder, hence Gideon slipping into this before his death, if this is why the people surrendered to the Baalist that were in retreat. Perhaps not trusting the Elohim would step in again? Just some points to ponder from a different point of view.